Our first “Megacon.” By “Megacon” I am referring to a convention larger than 10,000 people. I know that in many ways there are larger conventions such as San Diego Comicon, Otakon, Anime Expo, and the like. Having staffed some and attended others I found that over 10,000 the shows actually become very similar in feel and attendee behavior. Although, attendance at shows seems to be teetering towards destructive to the venues. Let me start by saying that this was our largest booth to date. We had a 10’x20’ space, which was two vendor’s spots. It was also the first event we ever rented a van to carry our merchandise. I went into this show as a “make or break” for Megaroad Toys and Entertainment. I put every penny, and then some, the business had into Katsucon. My business partner and I knew going into this that if Katsucon fell flat we would cut our losses and part ways amicably, knowing that we did the best we could at making this a go. Now that I have the introduction covered I will say that most of the event I was nervous about the show. Friday started a little slow, but ramped up to a pitch I was not expecting. It felt like black Friday all afternoon. Now, from a sales perspective it was amazing; from a personnel point of view it was hell. My staff was busy from open till close and I had a rough time getting any of them a break. I did manage to do so. I have to thank my vendor friends Rick, Clint (http://aliciasanime.com), Jarred (http://mugentoys.com) , and Pete (Anime Fan Zone) for giving me some much needed assurances that I would do fine. Which, we did. I admit at times I have some low self-confidence, and the slower start on Friday made me very nervous. Saturday, from a business standpoint was terrifying. There was an electrical fire in the building that caused an evacuation into the frigid cold. I was in my typical con attire (T-shirt, shorts, and sandals). This meant I was shooed out into the cold with not much on. I understand what girls that wear skimpy cosplays feel now. We went out back to the loading dock, which was nothing but a wind tunnel. A number of us vendors were in there swapping stories, people that come to mind was Charles Dunbar (http://www.facebook.com/studyofanime), Pete from Anime Fan Zone, and the nice lady that owns Cutiepie Kawaii Shop (http://www.cutiepiekawii.com). The rest of the people in there I was unfamiliar with. This led to the vendors’ room being closed for two hours. My confidence in Katsucon being a success fell, but at the same time I was excited. Why was I excited? That is a simple thing, scheduling. There was two ways the return to operation was going to happen. First option, everyone would leave the con for the day and go back to their various hotels and party. Second option, everyone would come back to the con, because of the gazeebo, and hang out because scheduling was a mess. If the second option happened, besides hanging out at the gazeebo they would be looking for something else, a constant thing, to do. During the con, there are only a few things that are constants. They are: Gaming Rooms, Artist Alley, and Vendors. Gaming has a limited reach because there are people who just aren’t into gaming. 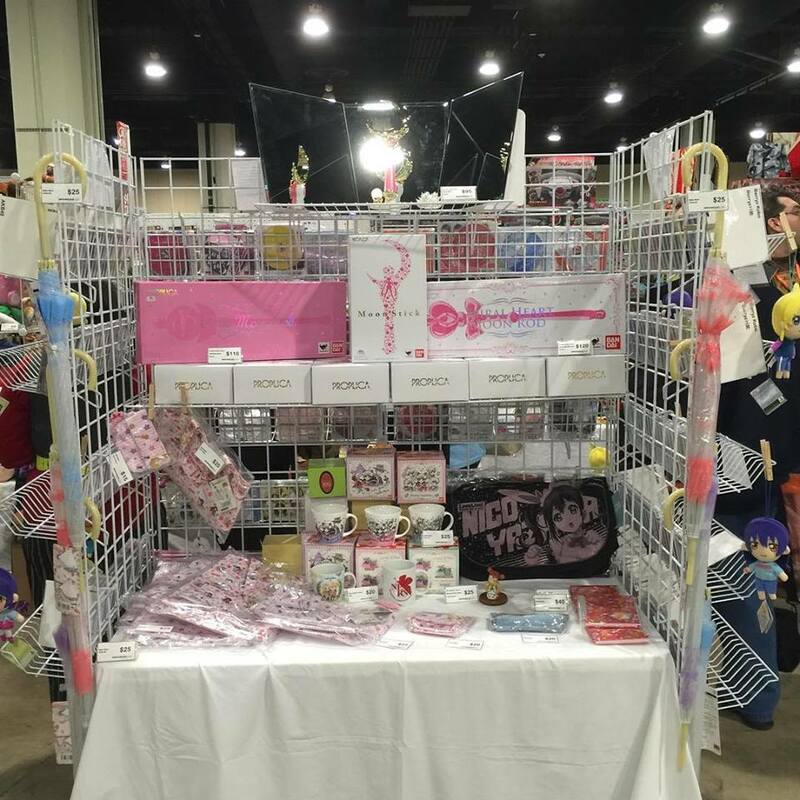 Artist Alley and Vendors have one thing that everybody can enjoy, shopping. Shopping they did. After a half an hour slow start, the attendees came. Boy did they come. It was wave after wave of attendees coming in because they didn’t have much else to do, or couldn’t figure out what was going on. I do not blame Katsucon’s staff for this. Actually, I want to thank them for the chaos in scheduling that occurred. The vendors’ room was at capacity the rest of the night. The room could have stayed open another hour and I would have been incredibly happy. The staff of Katsucon decided against it. Again, I do not blame them for that decision. If I had to wrangle all the vendors and the attendees and get them out of the building safely and quickly; I would want to close at the normal time just to relax and collect myself for the next day. Enough with the wordy commentary about the show. Let’s look at the booth and look at my analysis of what I did and didn’t do right. This was the first booth that I drew out plans for in advance. Now, when I got to the show I forgot to look at them, but somehow ended up with my drawing anyhow. If I would have followed my drawing, what was a multi-hour set-up of second guessing could have been done in 3 hours. The centerpiece of the booth. We commonly referred to it as the island of pink. This is where we showcased our Sailor Moon, high end Ghibili, general higher end merchandise, and music. Display wise this was a great center piece. The problem was it was an island that needed someone to stand by to keep things from walking off. Overall, this was one of my best booth designs. It showed that I planned out a bit of it... then threw that idea out, and somehow went back to it. Saturday elements of the booth changed. The tokusatsu toys moved to the right corner of the booth. When I moved them closer to the model kits and other "boy" toys, they began to move. I was happy about that as they are a huge part of the reason I started this business. With every booth there is something I am incredibly not happy with. This corner happens to be it. This is the left corner of the booth and it turned into a catch all and mess of back stock plush. It actually disrupted the flow of the booth and kept people from shopping our plush directly. I worked on this for Shumatsucon. The future of this corner will be built out as a real overstock corner with place to hide our stuff. I've got ideas on what to do here for Otakon (http://www.otakon.com); if we get into Anime Next (http://animenext.org/) we will try that new layout there. Now that I've looked at the booth to some degree, I'll move on to some cosplay pics. Since we carry a lot of Splatoon merchandise, I made sure to get pictures of a couple Splatoon cosplayers to share. This girl had an amazingly fun Splatoon cosplay, she bought the purple squid off of us. It is awesome that a purple squid girl cosplayer got to get her matching purple squid. Here is another awesome Splatoon cosplay, a Callie and Marie group. The picture does not do the costumes or the girls justice. Unfortunately, the picture I took that had both girls smiling was out of focus. and had a number of customers in the background. So, I posted this one because the background is good, the costumes look the best, it is in focus, and the shot is framed well. Overall, I really enjoyed Katsucon and do recommend going to it, if not for the show, do it for the amazing cosplayers there. The venue's gazebo and general photo opportunities just make this a good show to attend. I really hope the recent venue vandalism from attendees does not hurt their being there.